Frances Griffiths and Elsie Wright didn’t set out to fool the world—not on purpose, at least. Not really. But when ten-year-old Frances moved from South Africa to England with her mother in 1917, she began seeing fairies and gnomes and all sorts of creatures in the woodsy waterfall behind her Aunt Polly’s house in Cottingley, a small village in Yorkshire. But 16-year-old Cousin Elsie didn’t like it when the adults scoffed at Frances’ fairy stories. If Frances said she saw fairies, well, that was good enough for Elsie. So Elsie borrowed her father’s camera, one of those old-fashioned ones that used glass plates. Within 30 minutes the girls scampered back from the garden with an exposed plate holding—so they claimed—a picture of Francis and four fairies dancing through the air in front of Frances. Mr. Wright was an amateur photographer and maintained his own darkroom. As Elsie and her father waited in the darkroom for the image to develop, Frances stood outside the door eagerly anticipating the picture of “her” fairies. Much to Mr. Wright’s chagrin, the plate did, indeed, show Frances with fairies. He accused the girls of faking the photo. No one but Frances will ever know if she saw the fairies or not. Elsie, however, never claimed to see them. So she drew tiny fairies on paper dancing on their tiptoes, with filmy dresses and long hair flying. She painted them with delicate watercolors and affixed the figures with hatpins to a mossy bank among a tangle of ferns and flowers. A second rigged photo showed Frances holding her hand out to a gnome. Frances and Elsie put the developed photos away in a drawer and promised each other to keep their secret. Elsie’s mother—who happened to believe in fairies—went to a meeting of the local Theosophical Society two years later and mentioned the photos. Members of the Society believed fairies could very well be real. Added to this suggestibility was the context of many new things happening in the world: a newfangled thing called an X-ray could take a picture of the bone inside an arm that could not been seen by the naked eye. What was so different about a camera being able to take a picture of fairies that could not be seen by the naked eye? Over the next couple of years, experts declared the plates and the photos genuine, insisting they had not been faked. Sir Arthur Conan Doyle, who as a spiritualist (as well as an author) believed in fairies, took the evidence to Kodak, the company known for excellence in producing cameras and photography. Kodak also found no indication of fakery. In 1920 Doyle and other experts encouraged the girls to take more photos of fairies. In all, the girls took a total of five photos collectively referred to as the Cottingley Fairy Photos. Sir Arthur Conan Doyle’s article on the fairy photos in the December 1920 issue of The Strand sold out within days in London. An expert named Gardiner visited the girls with a clairvoyant named Geoffrey Hodson. Neither of the girls claimed to see fairies that day, but Hodson saw them everywhere, and took copious notes of their appearance and activities. Mary Losure has done a fine job of researching and writing this true story for young readers. 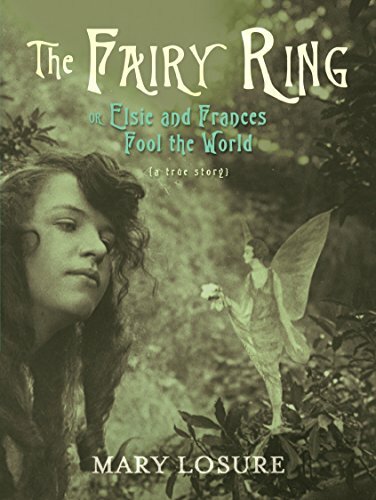 Those who believe that children can sometimes see things that adults cannot may well feel that Frances saw fairies—even if the photos themselves were faked. Others may believe that the stress of Frances’ father being away at war triggered the entire incident and that fairies are not real—not even in the famously ephemeral Yorkshire countryside. In either event, The Fairy Ring is an engaging story of two young ladies who, for a brief time, managed to fool the world.